"The convergence of patterns, models and tooling sets the scene for major increases in application development productivity by 2010. Now is a good time to get on board." You may read this IBM Redbooks publication for a number of reasons. Perhaps you are already familiar with the ideas behind model-driven development (MDD), and you want to learn about how to put those ideas into practice and how to convince others in your organization to adopt the approach. Maybe you heard something about the benefits of MDD but want to learn more about it before you are convinced that it is suitable for your project. Or you recently joined an MDD project and need to understand what it is all about. This book is written for technical practitioners and project managers who want to learn more about MDD in practice. It will help you understand how to put the ideas of MDD into practice using Unified Modeling Language (UML). You will learn how to articulate the advantages of MDD to both project managers and technical colleagues. You will see how the MDD software life cycle differs from other approaches and how you can effectively plan and manage an MDD project. 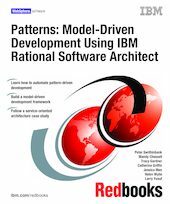 If you are already working on an MDD project, you will learn how to use Rational Software Architect to carry out your work.